Harvey is here to help you plan your holiday projects! Who remembers Harvey? A few years ago, local fabric and pattern designer, Emily Herrick, introduced us to her deer friend Harvey. With lime green antlers, Harvey was the life-size, patchwork deer who helped Emily introduce her popular Rustique collection at quilt market. He made an appearance here at Corn Wagon and was a big hit with the local quilters! We were excited to hear Emily released a darling Christmas collection this year with Michael Miller Fabrics and were even more so when we spotted Harvey among her designs. You'll find him hiding in the in the wintery forest, on ornaments and blending in with all-over patterns. 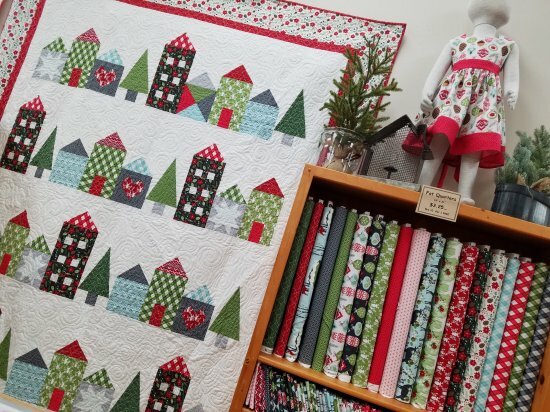 We love the traditional Christmas colored coordinates in the Rustique Winter line and are already throwing them into all-season quilts! These little houses pieced by Shannon White are already decked for the holidays. My Hood is a quilt pattern designed by Emily Herrick. It will be available any day now along with kits! And how about that little dress perfect for twirling by the Christmas tree made by Stacey Giles. It's never too early to start holiday projects and now that Harvey is here to inspire you, you can start checking those sewing gifts off the list! More Christmas fun arriving here at the shop! Now that temps are reaching 100 degrees, I don't mind the vision of snowy days ahead. 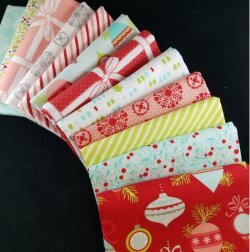 Winter inspiration is arriving almost daily including the highly anticipated Vintage Holiday collection by Bonnie & Camille of Moda Fabrics. It really feels like Christmas morning in our back room when we open boxes filled with great lines like Swell Christmas by Urban Chiks, Christmas Figs by Fig Tree & Co. and a delightful little collection inspired by the Nordic tradition of house elves appropriately named Hygge Christmas! A very special birthday is coming right up! It's one we wait for all year long. Our fearless leader, Marsha Harward, will be celebrating her birthday next Friday and you know what that means! FLAMINGO DAYS! Year after year these pink party goers are her FAVORITE guests. 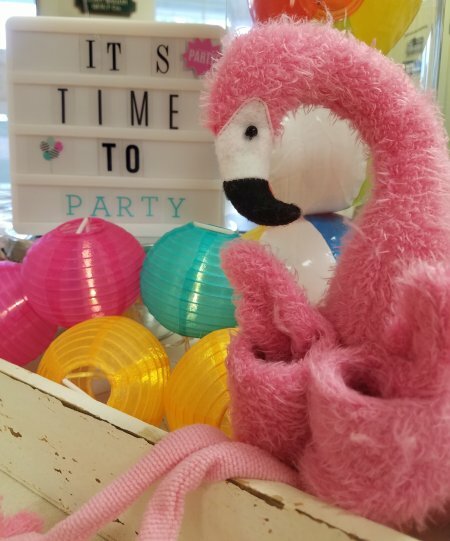 We hope you'll join in the fun at our annual PINK PARTY SALE Friday, July 6th where you'll receive 20% off all things pink! Fabric, notions, books, patterns, select kits; if it's a regular price item with even a smidge of pink, it will be 20% off in honor of Marsha's big day! Final Day to register for our Saturday Sampler is tomorrow! Saturday, June 30th. Register in store or online. For all the rules, details and to view our fabrics, please visit our website or stop in for a visit! Monday, July 2nd - 25% off FLANNEL including all regular price flannel yardage and hemstitching kits! Wednesday, July 4th in honor of Independence Day!